It’s a Little Mermaid retelling with a twist. The mermaid (well, siren really) kills princes. And the prince is a siren hunter. Yep, there it is. That’s all. Those two little things were all I needed to be absolutely sold on this book. And you know what? It actually lived up to its hype. It may have even surpassed it. I adored every single minute of this book and it definitely took its place among my 2018 favorites, that’s for sure. Because it took those two things that had me excited in advance and made them better than I even imagined it. Yes, this book has a killer plot. I mean, just reading the blurb will tell you that. But did you know that the plot is as great as it is because of the amazing characters in it? The characters could have easily been your typical one-dimensional villains and heroes. But they’re so much more than that. Lira is called “the Prince’s Bane”, because every year she rips out another prince’s heart to add to her collection. Any heart would do, but she has actually really does have a thing for princes. She’s a vicious siren, daughter of the Sea Queen and heir to the throne. Except her mother is abusive and wants to keep her absolute power. And maybe Lira does have a soft spot. Maybe she wasn’t always the vicious killer she is today. Except her mother made sure she turned out vicious and cruel and a threat to humans. And yes, this book has a hate-to-love romance, so that’s great if it’s a trope you already love. But did you know that the romance also has the best, most delicious and realistic slow burn? And that it is made even more enjoyable because there is so much witty banter? Because really, just cue these two characters who are already individually so well developed, interesting and multi-dimensional and then throw them together. And yes, it gets even better. When Lira’s mother takes away her song and turns her into a human with a mission to take Elian’s heart, things are definitely heating up. Don’t worry, there is no instalove. Remember, these two characters are eachothers’ sworn enemies. But maybe, just maybe, they slowly discover that they may have more in common than they think. And really, on top of all that, I have just got to mention the worldbuilding, because it is amazing. And with worldbuilding, I mean both the world above the sea as the world below the sea. Above the sea we are introduced to several intriguing kingdoms, each with a history and culture of their own. And below the sea we have so much fun sea lore with all the different sea creatures and their history. This whole world was just so well written and thought through that I’m almost sorry it’s a standalone and we don’t have a chance to discover even more. 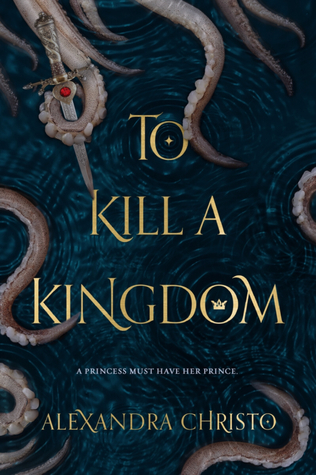 Overall, I definitely recommend To Kill A Kingdom if you are in the mood for a killer little mermaid retelling, a glorious slow burn hate to love romance, witty banter, well developed morally grey characters and/or amazing worldbuilding. HAVE YOU READ To Kill A Kingdom? WHAT DID YOU THINK ABOUT IT? Ahh, I’m so sad that I haven’t even SEEN this book on bookshelves 🙁 Ever since I had to scrap my own Little Mermaid novel, I’ve been itching to read some really good retellings…but it seems like most just aren’t up my alley. But this has been receiving such AMAZING reviews, and that cover is so gorgeous and HATE-TO-LOVE romance?? YES PLEASE!! I swear, I’ll get my hands on this someday! I do hope you’ll love this one as much as I did if you decide to pick it up! I’m so glad to hear this lives up to the hype. It’s one of my most anticipated reads of the year and I’ve been nervous to actually start it because of all the hype. I haven’t read any other mermaid books (I think), but I did highly enjoyed this one! WOW you’ve made me want to read this even more than I did before!! It looks soooooo worthy of the hype, and every aspect sounds incredible. I also love morally grey characters and realistic slow-burn romance. YAY! Thanks Amy! I definitely thought it was worth the hype 🙂 Hope you’ll love it just as much when you pick it up!